Finding the perfect image is always the first step in any custom wallpaper project. The right image for you may of course be entirely wrong for another, but once you've settled on your desired image, it's difficult to go back and change your selection. However, that's exactly what is required from time to time, as images that may look good on your computer screen can absolutely fall apart when blown up to mural size. Fortunately at Great Wall, we offer full design and image research services that allow us to circumvent most roadblocks to creating your custom wallpaper. Take the above imagery for example. The inspiration image on the left was stumbled upon by a client. The look and feel of the image was perfect for her wall mural, but the resolution of the image was such that it couldn't be printed any larger than an 8" x 10." What to do? 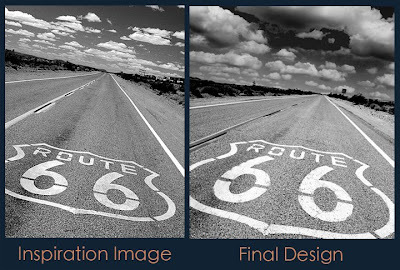 Using our stock image resources, we were able to locate a color shot of the historic Route 66 roadway with the same markings. First, we desaturated the image to black and white, and tilted the skyline to mimic the inspiration image. To finish the wallpaper design, we added in a different sky to the finished mural, to again emulate the inspiration image as closely as possible. The result speaks for itself: though the images aren't completely identical, the look and feel of the final design was so close to the inspiration image that the custom wallpaper project was able to achieved. Do you have an image you'd like to have considered for a wall mural? Visit our custom order page to get started.